Rugs are ancient technology, but this category focuses on the beauties of the modern world. Notice in the left foreground the white arch supported by red lines of the Swing Bridge. This one is reversed (note the white arch on right) with warehouse building in foreground. 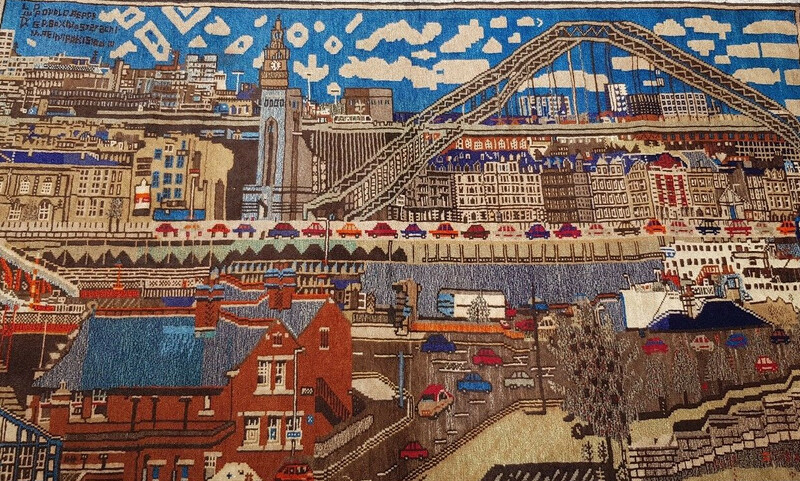 This entry was posted in Rug Images, Tech is Beautiful and tagged afghan rugs, bridge rugs, pictorial rugs, Rugs, tyne river brige on April 10, 2019 by Kevin. This entry was posted in Afghan Women, Baluchi Patterns, Exhibitions, General, Regular Rugs, Rug Images, Tech is Beautiful, The War, The Weapons, Uncategorized and tagged Art, arte, artwork, impressions, kevin sudeith, mikeweissgallery, nyc on May 14, 2016 by Kevin. 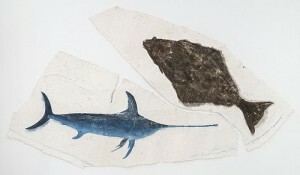 Kris Scheifele wrote a conversational piece about my work for NY Arts Magazine. Inspired by the human activity surrounding the rock outcroppings that serve as his canvas, Sudeith uses transportation motifs to explore his primary subjects: food, energy, and scientific exploration. This entry was posted in General, Tech is Beautiful on April 5, 2013 by Kevin. This entry was posted in Beautiful Picture, Rug Images, Tech is Beautiful, The War, The Weapons on December 23, 2007 by Kevin. This entry was posted in Tech is Beautiful on August 3, 2007 by Kevin. This Mario Rug in the style of Super Mario Brother 3 shows Mario riding a white horse. 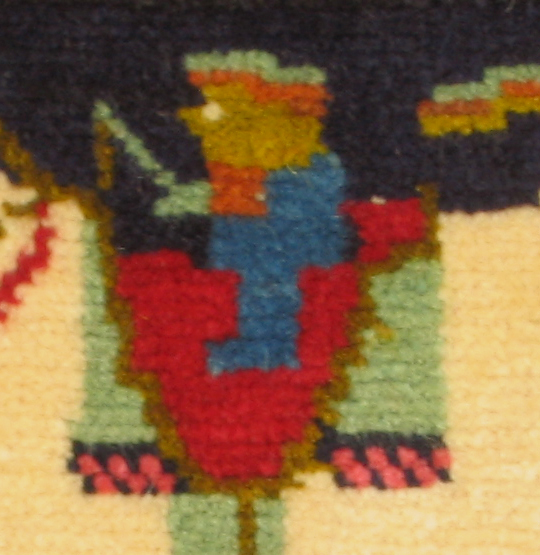 The horseman is the original figurative image found in carpets. 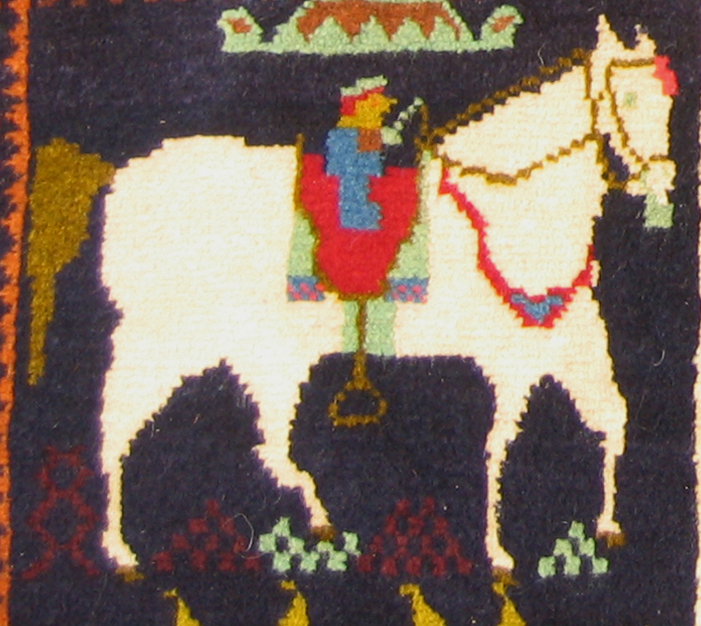 Horsemen are found in the wolrd’s oldest carpet, the Pazyrik, from the 5th century BC. This ancient image, the horsemen, coupled with an icon of digital culture, Mario, is beautiful. More images of the Mario Rug here. The original post of this rug, years ago, including size, structure, photos, and description is here. Note: This is a tribal rug, reflecting one weavers artistic vision. This rug was selected, with 25-30 others, from a collection of traditional design Afghan Baluchi rugs from Herat and Farah. 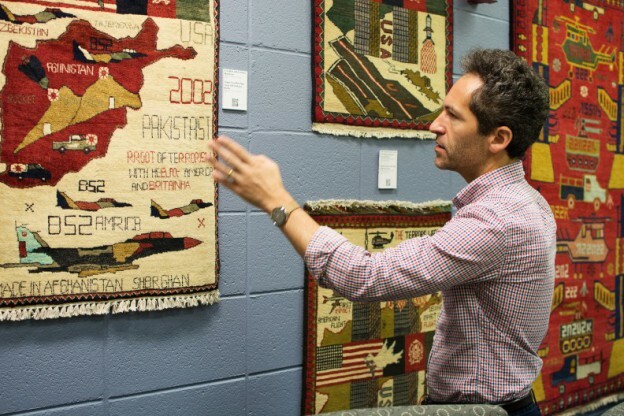 All the other rugs were of traditional designs bearing no war motifs or western images. This entry was posted in Baluchi Patterns, Beautiful Picture, Exhibitions, Regular Rugs, Rug Images, Tech is Beautiful on July 12, 2007 by Kevin. This entry was posted in Beautiful Picture, Rug Images, Tech is Beautiful, The War, The Weapons on June 13, 2007 by Kevin. But were afraid to ask. The iPhone forum. This entry was posted in Tech is Beautiful on February 25, 2007 by Kevin.